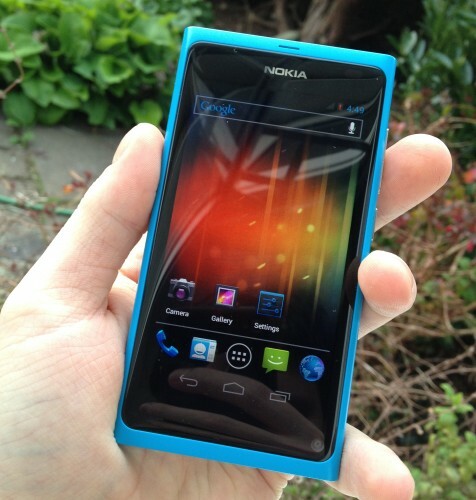 We have seen earlier in February about a N9 running on Android ICS in an initial build. But now there has been a lot of development on the ‘Project Mayhem’ as the developers behind it have named them it. And hey loads of features are already working on the MeeGo-powered N9 in the initial Alpha release. Most important of all is the dual-boot option that users will be able to take advantage of. Developers behind the ‘Project Mayhem’ have finally been able to side load Android ICS 4.0.3 alpha with MeeGo. To select between the two OS, all the user has to do is hold the volume key on power on and then he’ll get a screen to select which OS he wishes to run. Simple! Now coming to the rest of the working features (and the list is nice and long), we have multitouch, OpenGL, GSM and 3G connectivity, 3D drivers, All USB ports work fine, all buttons are recognised as well. LCD is shut when in sleep mode, Audio playback works as well through earpiece, headset and speaker altogether. Bluetooth, Accelerometer, Video decoding also work very well. Now, coming to the things that still need improvement, Charging works fine but then the power graphic icon on the device doesn’t work and is not able to show us how much the device is charged. There is a need for a hack in order to make the device recognize the Document folder. Video does work, but YouTube playback is a bit choppy. Now that is loads of positive things with a scope of improvement in all fields but it’s really great to see how the people working on it have got done so much in the initial alpha build. And it’ll also go on to be interesting what the next release will go on to feature. To check more on this alpha release head NITDroid Forum. Until then catch the demo of ICS running on N9 below to see the beautiful combo in action.